Tom Pelphrey to reprise his role as Jonathan Randall on ‘Guiding Light’ this summer. For the last month, Guiding Light fans have speculated if 2-time Emmy Winner Tom Pelphrey would return to the cancelled soap for one last hoorah. CBS Soaps in Depth is now confirming that the fan fave will be bringing Jonathan Randall back to Springfield mid-summer. Jonathan was last seen onscreen in March 2008, when he left Springfield with daughter Sarah after her mother, Lizzie Spaulding (Marcy Rylan), tried to kidnap her. Ultimately, Lizzie let Jonathan take Sarah out of town and he said his goodbye to his late wife, Tammy (Stephanie Gatschet), at her grave. Details are still fuzzy about Jonathan’s return to Springfield. Perhaps it has something to do with his mother Reva’s (Kim Zimmer) cancer returning, something the diva of Springfield has kept secret from her son. Or perhaps it has something to do with the impending nuptials between Lizzie and Bill (Daniel Cosgrove). Personally, I can’t wait to see Reva’s two sons actually meet. With Shayne (Jeff Branson) actually in town at the same time as Jonathan, we’ll finally get the meeting of the two brothers. Wonder what Dinah (Gina Tognoni) will have to say about that one! Pelphrey, a West Coast based actor, will return to the East Coast show as the series wraps up after a 72 year run. The Light will go out on September 18, 2009. However, there are rumblings of TeleNext Media, brokering a deal with The CW, Lifetime, or even Oxygen to keep Guiding Light alive. Our friends over at DaytimeConfidential.com broke yesterday that the Guiding Light cast has been spoken to recently about a deal with either Lifetime or Oxygen to keep the show on air. 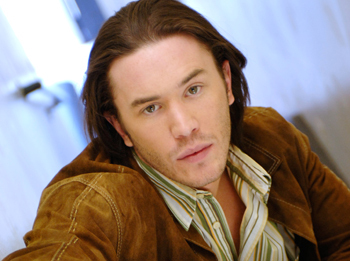 If the show were to remain on air, however, I wouldn’t hedge my bets on Tom Pelphrey to stay on as Jonathan Randall. The actor has made it clear he wants to make a go of it on the West Coast. If he were smart, he’d take that gig over on General Hospital opposite Maurice Benard as Sonny’s firstborn son Dante Falconeri. The role has in effect, been put on hold for Pelphrey as he tried his hand at pilot season this spring. With Guiding Light cancelled, or even revived with a reduced budget on a cable channel, it’d be nice to have a regular paycheck to count on from the house of mouse for the young actor. So what’s the hold up? I say wrap up GL, and head on over to GH. There are even a few familiar faces over there at Prospect Studios for Pelphrey. Personal friend Sarah Brown (Claudia, GH) has been hankering to get screentime with Pelphrey. And the smartest woman in daytime, Laura Wright (ex-Cassie, GL; Carly, GH), gets her nickname because she jumped ship from Guiding Light in 2005 and headed over to General Hospital where she gets frontburner storyline and job security. So really, what’s the hold up? When Guiding Light wraps up taping in July (barring a pickup from a cable net), Pelphrey needs to make the smart choice and join former co-star Laura Wright over on GH.